1. Heat the butter and 1 tbsp of oil in a sauté pan. Add the leeks and cook for 3 minutes with the lid on until soft. Add the garlic and cook for a further minute. Tip in the rice and cook for 1 minute, stirring to coat the rice in the buttery oil. 2. Pour in the wine. Let it evaporate before adding the stock ladle by ladle, evaporating each time and stirring constantly. 3. When half of the last ladle of stock is remaining, cut the asparagus into 2-3cm lengths and add them to the pan. Continue cooking until the rice is tender. 4. Stir in half the Parmigiano Reggiano and remove the risotto from the heat. Leave to stand. 5. Heat a small frying pan and add the remaining olive oil. Fry the basil leaves until crisp and drain on kitchen paper. 6. 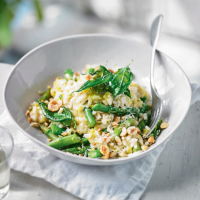 Serve the risotto topped with the fried basil leaves, toasted hazelnuts and remaining Parmigiano Reggiano sprinkled over.